When he arrived in Tokyo in 1859, Alcock selected a temple called Tozenji as the first legation because it was the largest of the four he was offered and was convenient for both the bay, in case there was a need to evacuate by sea, and the road to Yokohama and Kyoto: besides, he was much taken by its beautiful Japanese garden. Temples, with their many rooms and spacious grounds, and often with special apartments set aside for visitors, were the most practicable buildings for westerners to adapt to their use, even if they had to share the grounds with the Buddhist monks. So frequently, however, were foreigners attacked, sometimes fatally, that many of the diplomatic missions soon withdrew to the relative safety of Yokohama. The worst attack on the British legation was in July 1861, after which the Japanese guard was increased to 500, and later supplemented by British forces from China. Nevertheless, the legation staff was forced to withdraw to Yokohama, and demands came from London for a more defensible site for the legation. The Japanese produced one in a new diplomatic quarter at Gotenyama, and undertook to build on it at Japanese expense a strong legation to British designs, with walls, ditches and stockades. In January 1863, however, the incomplete buildings were burned down and the British decided to remain at Yokohama, using Tozenji on essential occasions, until they were better accepted, or could be better defended, in Tokyo. When Tozenji deteriorated beyond use, another temple near Sengakuji, at Daichuji, was used instead by visiting legation staff from Yokohama. Harry Parkes succeeded Alcock as minister in Japan in 1865 and jibbed both at the indignity of being excluded from the capital and at the wastefulness of time spent travelling between Yokohama and Tokyo. He persuaded the Japanese government to erect a temporary one-storey timber legation in a courtyard in front of the Sengakuji temple, into which parts of the legation moved in November 1866. For a spell, ‘HM Legation Sengakuji’ was the letterhead. 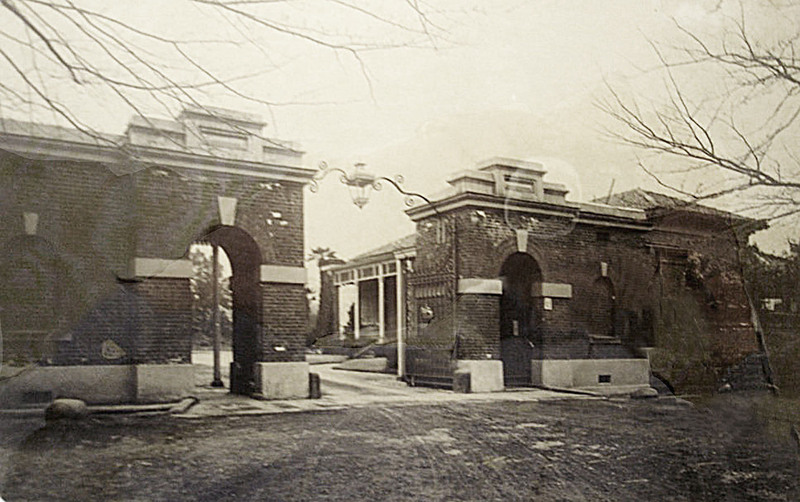 William Crossman, a Royal Engineer visiting from Shanghai, condemned this hutment structure as only suitable for bachelors, and then only in summer, but it had perforce to remain the British base in Tokyo for a further seven years. Meanwhile, Crossman helped to improve the legation’s accommodation in Yokohama, where it was located on the Bluff, completely separate from the consulate. By 1871, Tokyo was becoming safer for foreigners and Parkes decided that it was time to move the legation permanently from Yokohama. 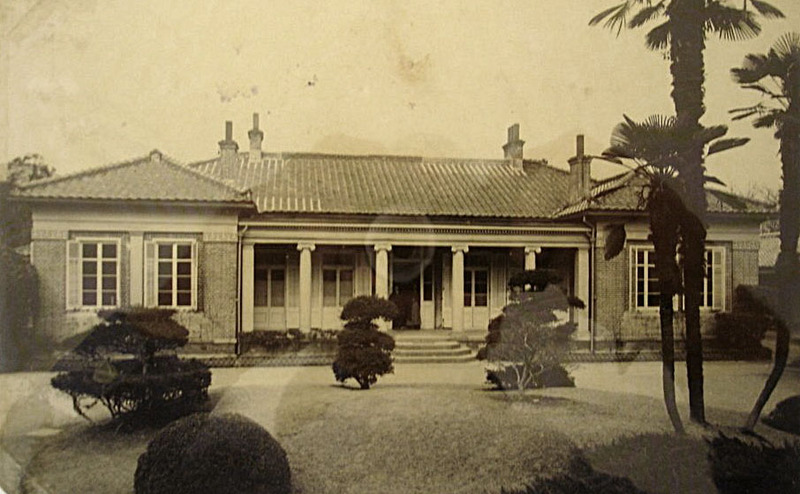 He had for years been keeping an eye out for a suitable eventual legation site in Tokyo and in 1871 earmarked a plot outside the Hanzomon Gate in Kojimachi, close to the Imperial Palace. Robert Boyce, from Shanghai, inspected this site, which was rectangular and a little under nine acres, in May 1871 and pronounced it suitable, although not ideal. He straightaway drew up proposals for setting out the compound, and outlined designs for the minister’s residence, chancery offices, several single-storey houses for UK staff and ancillary buildings. Parkes endorsed these plans and Boyce sent slightly more developed versions of them to London in November 1871. The Office of Works tinkered with them and secured the Treasury’s approval: the residence was estimated to cost about £8,000 and all the rest about £18,000. Boyce’s proposed layout of Kojimachi compound, 1873. (North is to the right.) 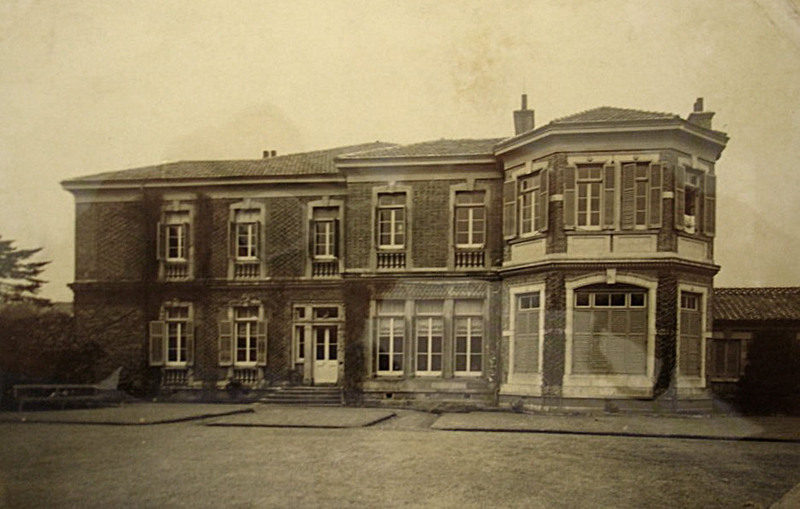 The five central houses are (from left to right) students’ quarters and vice-consul; Japanese secretary; secretary of legation; chancery; and minister. A provisional lease was taken on the Kojimachi site in May 1872. 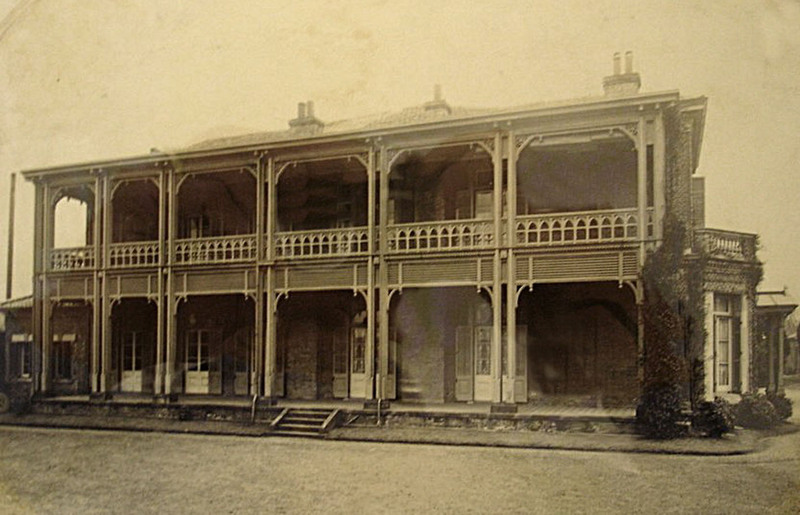 Boyce returned in August 1872 to set up contractual arrangements for the buildings but found that, in Parkes’ absence on leave, second thoughts had set in. The newly-arrived chargé had doubts about building a residence in Tokyo, not least because a railway had now opened that brought the door-to-door journey from Yokohama down to an hour. Plans were put on hold until Parkes’ return to Japan early in 1873. He promptly put paid to the second thoughts, and work on site started in March 1873. The contract itself proceeded relatively smoothly but the legation kept changing its mind about the scope of what to build in the light of staff changes and of the Japanese Secretary, Ernest Satow, insisting on living off-compound. Relations between Parkes and Boyce also grew strained about what had and had not been agreed about the residence. Parkes, for example, concluded that a pavilion should be included in the residence plans to serve as a ballroom but the Treasury refused. The compound was ready for occupation in January 1875 and the new buildings were roundly criticised by their first occupants for all manner of inadequacies, although they were built to plans that they or their predecessors had approved. Boyce sorted out most of the problems before he left Shanghai in 1876. The buildings’ appearances were included in the criticisms but gradually their brick suburban demeanour became a source of comfort and pleasure, especially to many British visitors. Parkes left Tokyo for Peking in 1883 (and died there two years later). The 1872 provisional lease of the compound was superseded in 1884 by a new one signed by the Governor of Tokyo which granted tenure to the British in perpetuity in exchange for an annual rent of six silver yen per hundred tsubo (about 3.3 sq.m., the area of two tatami mats) – the equivalent of £200 per annum for the whole compound. It later became of significance that the lease contained no provision for reviewing the annual rent. In 1894, the tower which Boyce had built at Parkes’ request at the residence to provide a cool sitting area with a good view of Mount Fuji, collapsed, despite much binding around with iron straps, as a result of the frequent earth tremors: an omen. In 1901, when the addition of a ballroom was finally approved, the minister of the day decided that an internal rearrangement within the house had rendered it unnecessary. A decade later, a large new dining room was instead built beside the house. Boyce, in his report of a tour of inspection of Far East Posts when he was on the point of retirement in 1899, wrote (without any reference to his own work) ‘that the legation buildings, notwithstanding that they have been subjected to more or less severe earthquake shocks, are all in excellent and substantial order, and the grounds … are beautifully laid out and kept’. Main compound entrance with clerks’ quarters beyond. 1911. 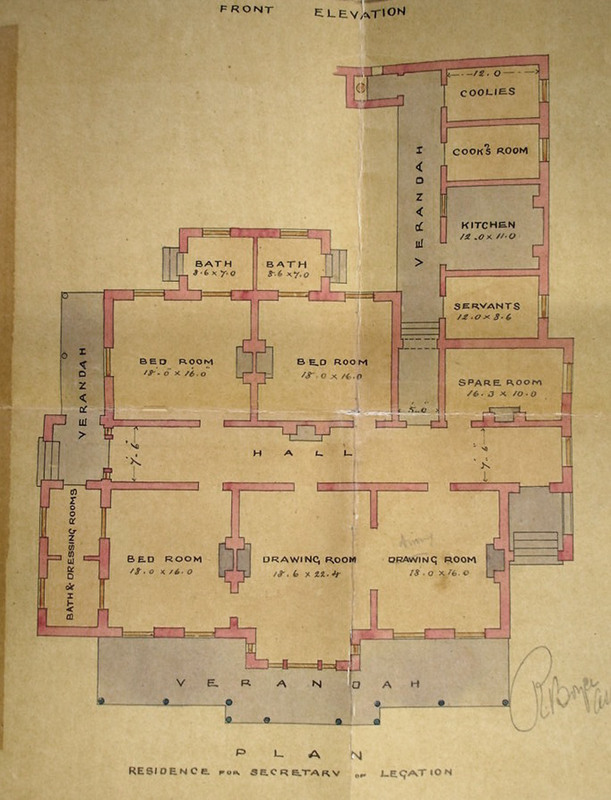 Ground floor plan of minister’s residence, 1920. Entrance front of minister’s residence, c.1900. 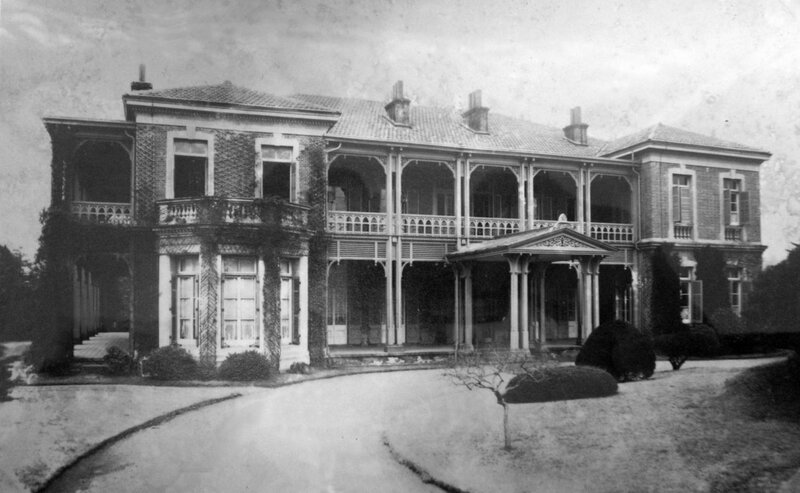 West front of minister’s residence, c. 1910. East front of minister’s residence, c, 1910. 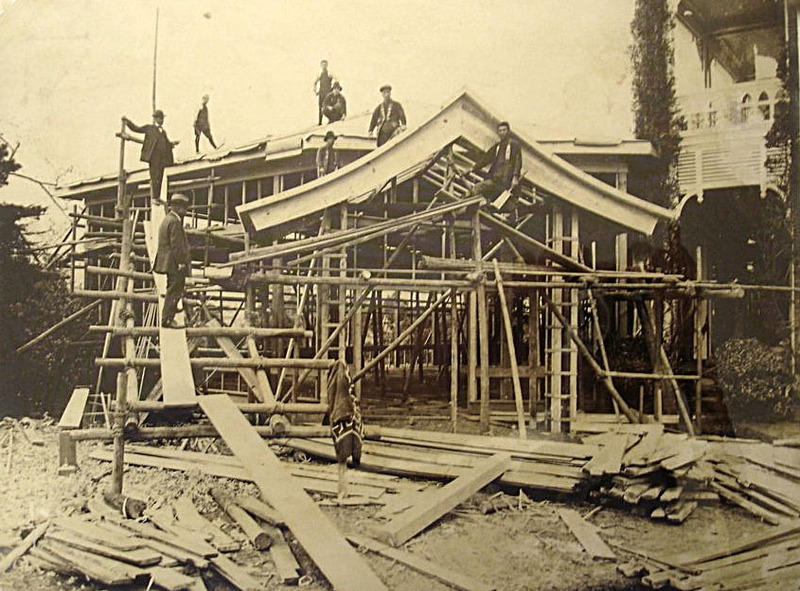 Construction of large dining room along west side of residence, 1911. 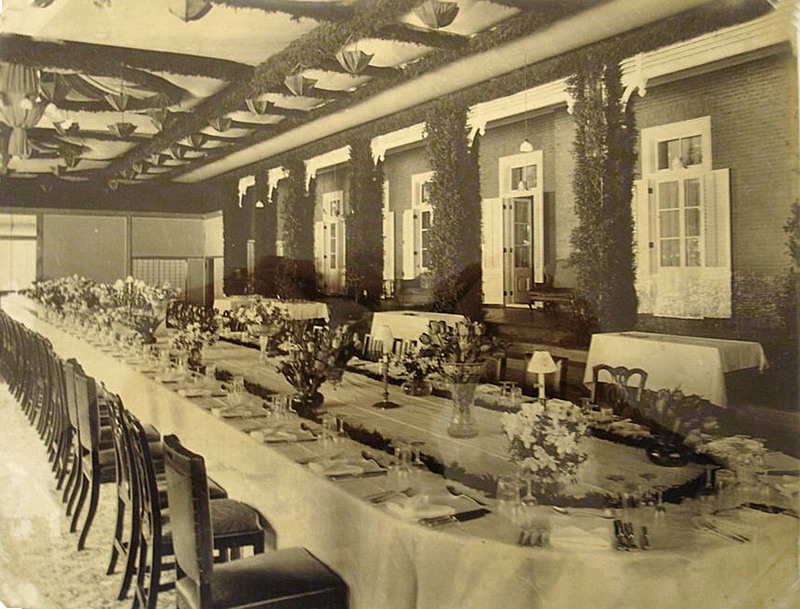 Interior of new dining room, 1911. 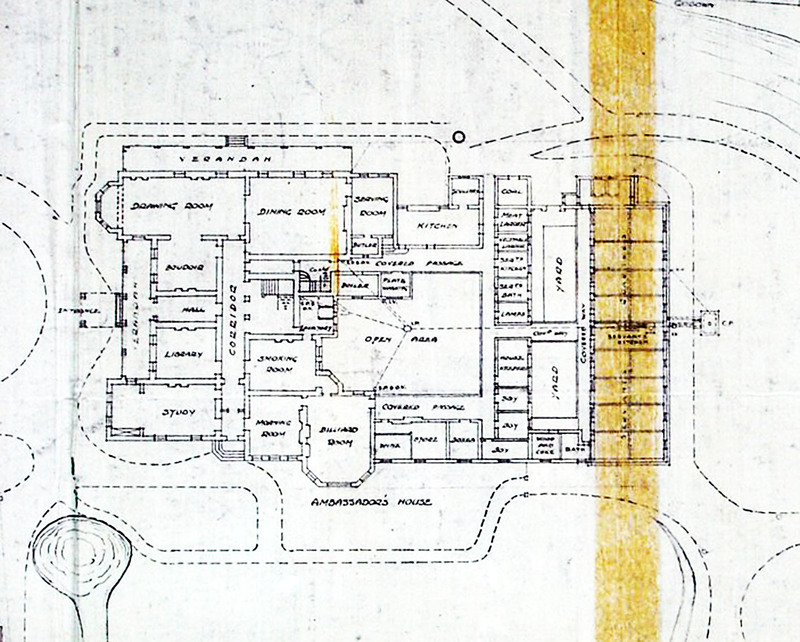 Boyce’s floor plan for secretary of legation’s bungalow, 1871. 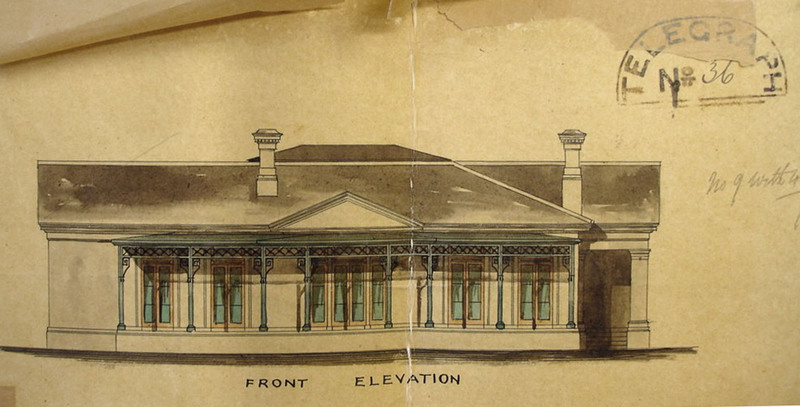 Front elevation of bungalow for secretary of legation, 1871. South front of chancery office building, 1911.